There’s never a good time to be homeless, but if you’re living in the Northeast and it’s winter, it can certainly be a little tougher to find the proper shelter when the temperatures dip below freezing and the wind and snow are whipping around every corner. 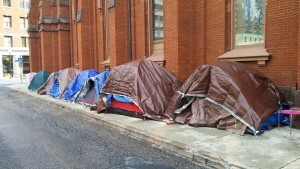 A tent community that involves 20 total tents and 25-30 people lines one of the sidewalks at Market Square Presbyterian Church in Harrisburg. In Harrisburg, many of the city’s homeless previously had converged under the Interstate 83 bridge and near the PennDot building seeking protection from the elements. However, officials have banned those without housing from setting up the camps in that area this winter, leaving the less fortunate with two less places to call “home.” Sensing that need, Market Square Presbyterian Church in downtown Harrisburg is providing a place on their sidewalks for the homeless to gather and also is helping to provide them with some important shelter like tents and sleeping bags to be able to survive during these cold months. There are between 25-30 people living in the shadow of the church building in an estimated 20 tents. The tent community is situated on the side and rear sidewalks of the Market Square Church building. It was set up in mid-November and will remain until the temperatures begin to rise in the spring. While this area has been specifically designated for this need for the first time this year, around a dozen folks from the homeless community can be found sleeping in the safety of the perimeter of the church all year long. While some of the homeless have their own tents, the church and other community groups provide others for those who are in need, as well as supplying sleeping bags. The church also connects people who are in need of these living supplies with organizations that offer those goods. Market Square Church is a prime location for the homeless because there are several feeding missions that come to the area. The church also does its part to supply needed resources for them. Despite all of the good that is coming from the tent city, there are plenty of detractors outside of the church who would like to see the homeless living somewhere else. The fact that the tents are situated on the sidewalks is a concern for city officials, but as long as there is still room for people to walk past the tents and it’s only a temporary setup, the city is allowing the tents to remain where they are. Tax returns will once again be prepared at Market Square Church at no cost for people of low and moderate incomes. Last year over a thousand people were served at the church with an aggregate monetary return of over a million dollars to the people served. 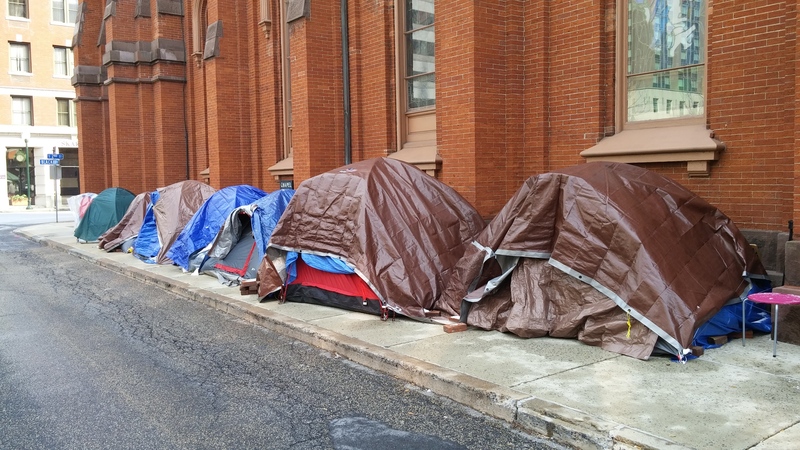 In the spring when the tent city outside of Market Square Church is gone, there will be another reason for the less fortunate to keep the church in mind. This year for the third straight year Market Square will provide tax assistance in partnership with the United Way’s “Money in Your Pocket” program. 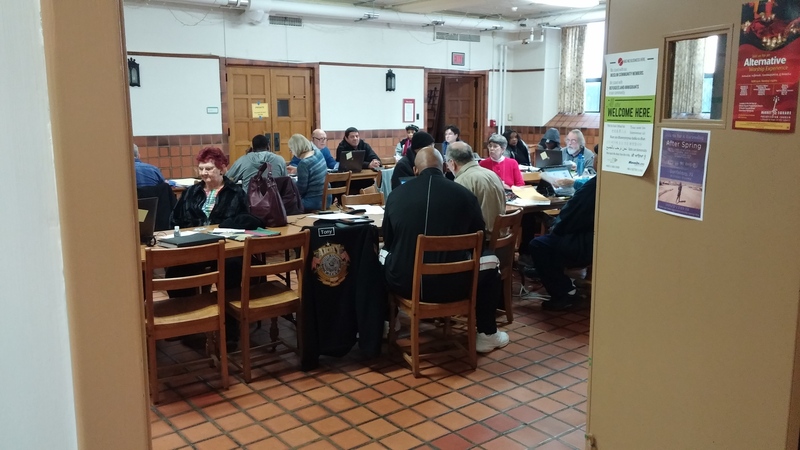 From 10 a.m. to 3 p.m. on Tuesdays and Thursdays from mid-January through tax day to the end of April, the church is providing low and moderate income people a place to come for free tax-filing assistance. Last year, over 1,000 people submitted their taxes through this program at Market Square, resulting in over $1 million in total returns. While United Way provides this service at several locations throughout Dauphin County, the one at Market Square is its largest.